Are you on the hunt for your next big career break? Perhaps you’re just waiting for the right opportunity to come your way, well, look no further. 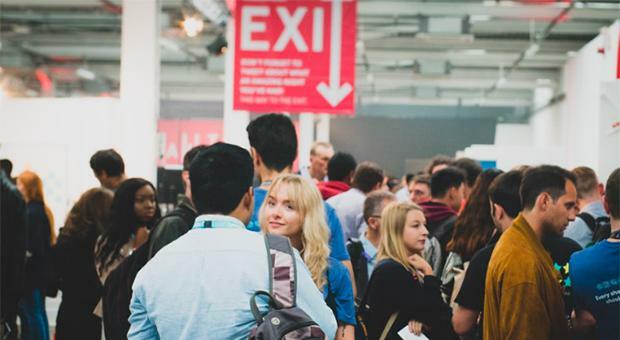 Jobbio HIGHER is one of Europe’s biggest career fairs. The event brings together the top tech companies from around the world with the very best talent. Unlike traditional (and boring) networking events, Jobbio HIGHER is a fun and interactive gathering where potential candidates can meet the real people behind some of the best-known brands. This year the event is coming to Dublin for the very first time in conjunction with Dublin Tech Summit (DTS). Over the course of two days, Jobbio will be gathering the hottest companies in Dublin under one roof. On Day two of DTS, Jobbio will hold Codefest, an epic challenge where mobile developers will take on an innovation-sprint to create mobile apps that can help connect the community to the homeless. So, if you would like to come along all you have to do is book your free ticket, show up and prepare to network your socks off. Here is just a little taster of some of the great brands that will be attending. Free food, excellent parental leave and a wellness allowance, that’s just a few of the perks that Facebook offers its employees. Meet the team at Jobbio HIGHER to find out more. Workhuman is the world’s fastest-growing integrated social recognition and continuous performance management platform. They put their people first and are known for their caring culture. Jobbio is an online careers marketplace. Their growing Dublin office has a friendly and open atmosphere with staff enjoying free weekly HIIT and yoga classes. Amazon Web Services have millions of customers the world over and now they’re looking to expand their global team too. Could you be the right fit? Full healthcare coverage, comprehensive parental leave and volunteering days are just some of the amazing benefits that Mastercard offers its employees. Check out their stall at Jobbio HIGHER to find out more. McAfee is one of the world’s leading independent cybersecurity companies. Do you want to make the world a safer place and enjoy a host of excellent perks? Of course you do. Vhi is the largest health insurance company in Ireland. They currently employ over 1,000 people and are looking for the brightest and best employees to join the team. Do you fit the bill? Bank of Ireland is on the hunt for some new hires. They place a strong focus on training and upskilling opportunities so that employees can reach their personal and professional goals. The team at Groupon enjoy autonomy in their roles while still being supported through their career path. Check out their stand to find out more. Apple is a brand that needs no introduction. They are currently expanding their Dublin team and need bright and ambitious individuals to apply. Career development and growth are paramount at Fidelity Investments, where employees can benefit from a number of mentoring and educational supports. Flash Pack is committed to the development of its employees and offers practical and financial support for those who wish to upskill. You can find out more on their Jobbio page. The team at Slack enjoy excellent health and wellness benefits including health insurance, weekly massage therapy and a monthly fitness supplement. Sign us up! Ryanair was founded in 1984, since then the company has seen explosive growth. Would you like to be part of this exciting team? Drop by their stand at Jobbio HIGHER. Zalando is Europe’s leading online platform for fashion and lifestyle. The company culture is one of empowerment, trust and considered feedback. Overstock is a tech-driven online retailer that sells a broad range of products in the latest trends. Their European software development hub is based in Sligo while their main headquarters are in Utah. Next up we have another US company. The employees at Pramerica in Donegal enjoy an arcade area, an onsite gym, a large cafeteria and an innovation lab. Sounds pretty good to us. Musgrave is Ireland’s leading food retail and wholesale company. They’re looking to grow their team with hard-working, innovative people with a passion for learning. Avanade was founded in 2000 by Accenture LLP and Microsoft Corporation. Today, they offer employees great perks like a dedicated career manager, competitive base salary and a reward and recognition scheme. Over 10,000 enterprises worldwide rely on Qualtrics to consistently build products that people love. Would you like to be a part of this exciting growing team? A culture of respect and humility are at the centre of everything that Tableau does. They’re a close-knit team who achieve goals and learn from losses together. BT is a company championing diversity from its extensive customer base to their growing team. Pop by their stand at Jobbio HIGHER to find out more about their company values and hiring prospects. Do you have drive and ambition? Are you passionate about the disruptive power of technology? Then OYO wants you to join its rapidly expanding team. Bank of America is one of the world’s leading financial institutions. Their Dublin office employs around 700 members of staff. Over 80% of which are in technology and operations roles. Circle is a global crypto finance company. They are looking for ambitious, hard-working and experienced candidates to join their Dublin team. Could it be you? Asana is a web and mobile application designed to help teams organize, track, and manage their work. Pop by their stall to find out more about the team and their exciting perks. Founded 30 years ago, Planet Payment now has over 1,100 employees in 58 countries spread across five continents. They’re passionate about diversity and learning. The Future Finance team is made up of 90 employees across offices in Dublin, Chicago and London. Could you be number 91? The SOTI team are committed to delivering best in class mobile and IoT device management solutions. They are looking for out of the box thinkers that appreciate the art of creating great software. Founded in 2011 and based in San Francisco, Segment provides customer data infrastructure. Employees get lots of perks like commuter benefits, relocation bonus and a flexible work schedule. Freedom is a key value at Airsorted. Staff members can mix up where they work, avail of free snacks and even take pawternity leave if they get a new puppy. GS1 takes great pride in looking after its team. Employees receive a competitive salary with annual leave, a pension contribution, performance-related bonus and a wellbeing contribution towards their gym membership. TradeIX is an award-winning company driving change by facilitating the flow of goods, money, and credit in global trade. If you like fast-paced work environments they could be the company for you. Competitive salary, stock options, birthdays off and Cake Tuesdays are just some of the perks offered by venture capital backed technology start-up Rentuu. Dyson is a fast growing and ambitious brand. Their three core values are Different, Authentic and Better. They use these catchphrases to determine everything that they do. Remember that you can apply for roles with just one click through Jobbio so make sure that your profile is up to date before the big event. You can find all the available jobs on the Jobbio HIGHER at DTS channel here.